At Integrity Wholesale Furniture, we’re always happy to celebrate the success of businesses who work hard, produce excellent products, and take pride in the work they do – just as we do. We take joy in seeing the Cleveland businesses we’ve served thrive, as well as the ones responsible for providing such wonderful office furniture for us to offer them in the first place! One such company, whose name you are probably familiar with, is Steelcase. Steelcase is currently celebrating one century of being in business this year. One hundred years of quality and integrity – values we can certainly get behind! We are happy to showcase today two excellent products from this fine manufacturer we’ve grown to value and trust through the many years they’ve been around: the Steelcase Avenir workstation and the Steelcase Answer cubicle. The Steelcase Avenir 6’×6′ cubicle keeps it monochromatic and simple, making it easily fit into any environment, no matter what the existing décor. It consists of 53″ high light grey panels, darker grey trim, and a white work surface. 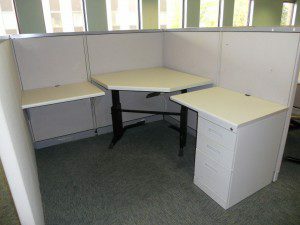 This cubicle comes with one BBF pedestal to accommodate office supplies and files alike, and is, of course, fully equipped with power down the spine. What makes this Steelcase cubicle different is the fact that you can adjust the height of the 24”x42” corner worksurface! Your employees can choose to elevate it a little to optimize it for their size or just to add a little visual interest, or they can leave it at the same level as the two 24”x30” returns. Whatever the case, options are always good to have, and this cubicle gives you just that. This excellent Steelcase Answer cubicle measures 6’x8′ and has 66″ high panels, providing the perfect barrier against the general din around the office. Adequate work surface is certainly not lacking, with one 24”x48” corner and two returns – one measuring 24”x24: and the other 24”x48”. This cubicle also has decent secure storage space! It comes complete with a locking BBF pedestal, a locking two drawer 36″ lateral file, and two 48″ overhead binder bins – one 48” and the other 24” – complete with a task light. The Answer cubicle is another neutrally-colored model that will fit right in to any situation. It has a strong granite laminate work surface, dark grey metallic trim, and textured print on the fabric covered walls. Either of these could be a great option to consider! Both are made by Steelcase, so you know the exceptional quality they were created with. However, the fact that they’re now being offered by us here at Integrity Wholesale Furniture speaks to the fact that they’re in incredible condition and ready to serve you well for many years to come! We have our used Steelcase Answer cubicles and Steelcase Avenir cubicles standing by, ready to ship as soon as you say the word. If you’re at all interested in either of these wonderful Steelcase products, please drop us a note to inquire as to how they could fit in with your plans. We also have a wide variety of excellent quality office chairs by top brands to choose from, as well. Check out our inventory and see how Integrity Wholesale Furniture can provide for all of your office furniture needs, right here in Ohio. No Comments on "Take a look at our used office furniture in Cleveland."